The Harsimus Stem Embankment, Sixth Street and Monmouth in Downtown Jersey City. It once carried seven tracks of the Pennsylvania Railroad to the Hudson River Waterfront. 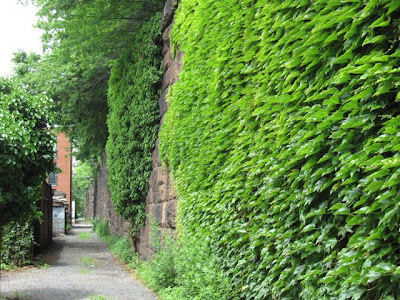 * Jersey City has a railway preservation project of its own, however one different in many ways from the High Line. Unlike the 1930‘s Deco steel framework of the High Line, the Embankment was built at the turn of the century and is a massive segmented stone structure. 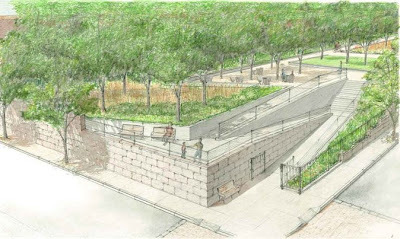 The extant Embankment is three times wider than the High Line (100 feet to 30 feet), but one third as long (1/2 mile as opposed to 1-1/2 miles). Since it runs through National Historic Districts in Downtown Jersey City, it won't have new buildings rising up along it, though there may be new construction at each end. 6th Street Between Erie Street & Jersey Avenue. a 3000-mile walking and bicycling trail from Maine to Florida. The Embankment, at least until light rail is implemented, will be wilder and more secluded than the High Line, with much area reserved for natural habitat. (See below for a conceptual rendering taken from the Embankment website). 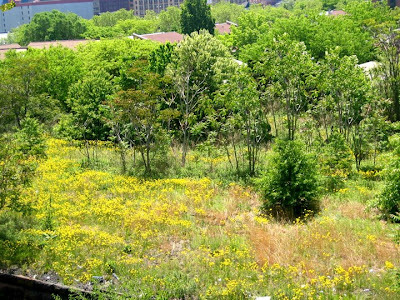 More recently, the Coalition has worked with the City of Jersey City to contest the sale by Conrail of the right of way to a developer, before obtaining a required federal permit to abandon the rail line. In addition to the goals of historic preservation, park, and trail, the City wants to preserve the corridor for light rail to relieve increasing traffic congestion. * Most of the above information came from the website of the Embankment Coalition (the non-profit dedicated to the preservation of the Embankment). 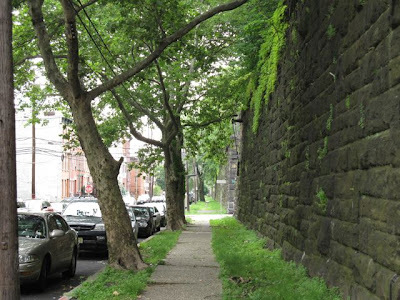 For more on the history of the Embankment, see Rick James' Nomination of the Embankment to the State and National Register of Historic Places on the Jersey City Landmarks Conservancy Website. Under the photo captioned: "Alley between Jersey Ave. and Coles Street," I excerpt the following: ...."the coalition has worked with the City of Jersey City to contest the sale by Conrail of the right of way to a developer...."
There are two inaccuracies: 1) It's more to the truth that The City is now working with the Coalition..." rather than the other way around. 2) "...to a developer...". The "developer" in question should not be considered a "developer" at all as he's never developed anything in his life except his own bank account. Besides, technically he's not even the "owner" of the Embankment, so what gives?